I’ve had this photo for a while now, and keep forgetting to share it. When I reviewed Grub Hut in Manville for the Packet back in June, this was the starter my friend and I shared. Loved this place. 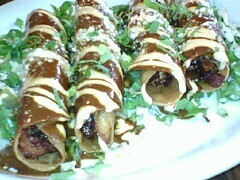 It was a blackboard special, Jefe’s (the boss’s) Mole Flautas ($9.95). Sassafras wood smoked chicken was shredded and rolled in 4 tortillas before being fried to a crisp Richly flavored mole, the famous Mexican sauce with a touch of chocolate, had been ladled over the flautas, then drizzled with spicy chipotle cream and given a sprinkle of cotija cheese. Gone in a flash!